Oh my crowning glory… As you know last year my hair was quite bad condition, it was frizzy, unruly and split ends because I perm and colored it too often. Well, I have tried trimmed the damaged hair and go for treatments several times but not much help also. 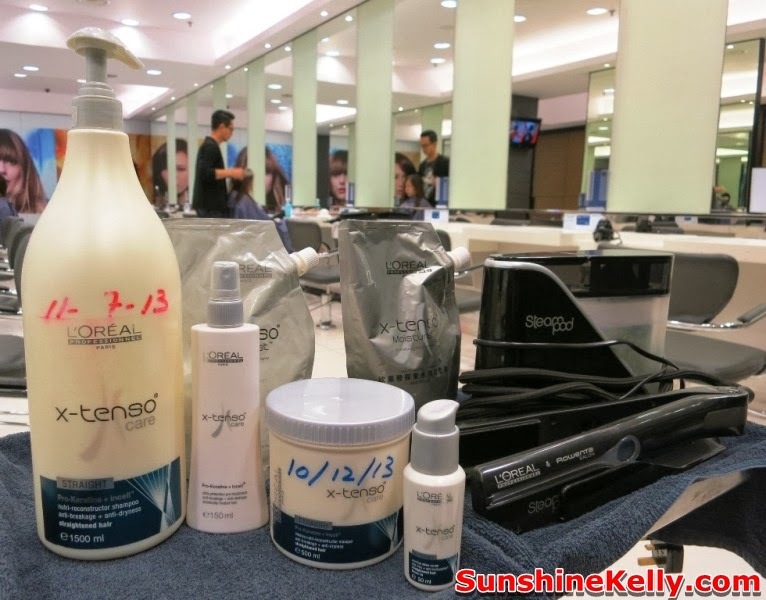 Then I was introduced to Steambond Hair Treatment by L’Oreal Professionnel @ A Cut Above Salon. 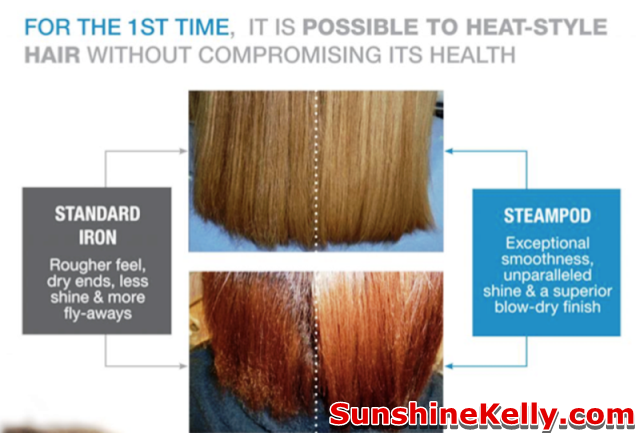 Steambond is hair straightening treatment is so much better hair rebonding treatment. It do not caused any damage to the hair. After a few fail attempts to rescue my damaged hair finally I found a solution, I did Steambond X-Tenso Hair Treatment by L’Oreal Professionnel at A Cut Above Salon in Bangsar Shopping Center and till now I have a straight, silky and shinny hair. 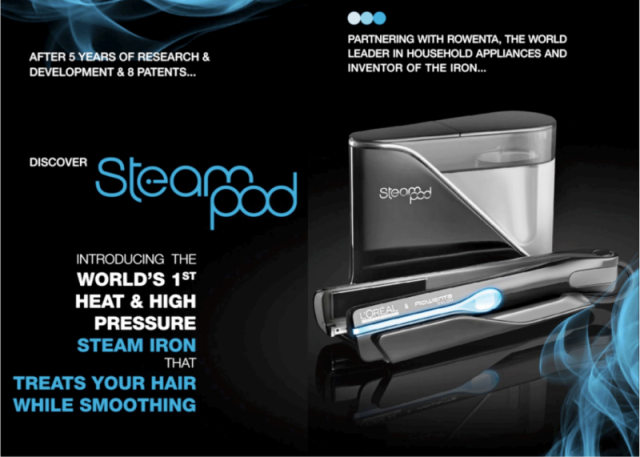 Steambond is an innovation by L’oreal Professional with Rowenta Salon Electricals. 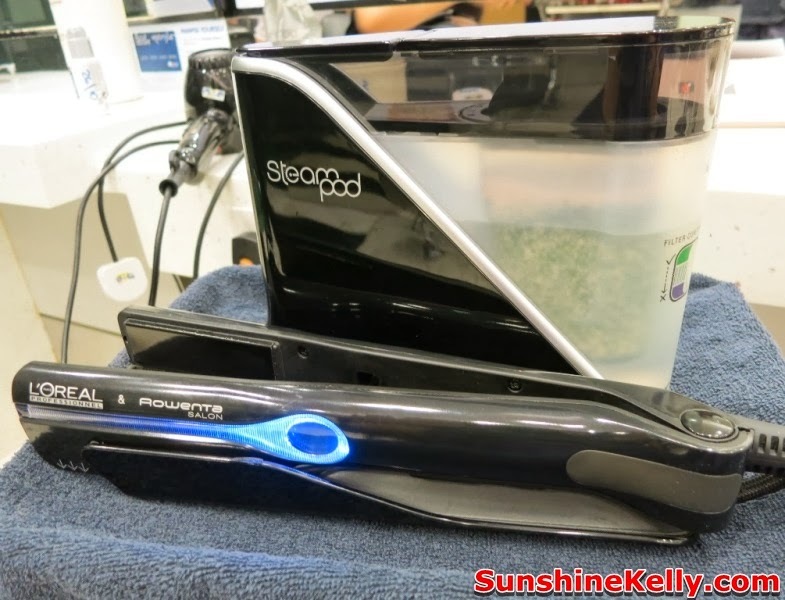 This is an in-salon straightening and smoothing service that utilizes Steampod, the world’s first heat & high-pressure steam iron that treats the hair while smoothing and delivering a nourishing pro-keratin hair treatment. This steam iron does not burnt our hair or caused any dryness or damage unlike in regular straightening treatments or rebonding. Well, the whole process of my Steambond X-Tenso Hair Treatment took about 4 hours, so if you are doing this treatment be prepared to bring your books, magazines, iPad, Tablet or smartphone to occupy yourself. These are the products that were used for Stembond Hair Treatment; L’Oreal Professionnel X-Tenso Care Pro-Keratine + Incell Straight Shampoo, Pre-Treatment, Moisturist 1 Smoothing Cream, Moisturist Neutralizing Cream, Mask, Serum and also the most important equipment is the Steampod to straighten and smoothen my hair. Steampod delivers a continuous stream of pressurized steam from an in-built steam generator. This is a new, effective and long-lasting steam-activated straightening treatment. The steam gently opens up the hair cuticle, progressively warming up the fiber to prevent heat shock. The repairing treatment is then delivered to the core of the fiber, the cuticle is smoothed and the ends are sealed for a flawless finish – and the transformation is immediately visible. The process started off with using the X-Tenso Shampoo to wash my hair to rinse away the impurities and then apply Pre-Treatment. After that, applied the Moisturist Smoothing Cream then use the Steampod steam iron to treat my hair while smoothen and straighten it. This process takes a while it a tedious steps. After the straightening process then they applied the Moisturist Neutralizing Cream and leave it for 10 minutes then rinsed off. Then next was applied the L’Oreal Professio X-Tenso Care Pro-Keratine + Incell Straight Mask and leave it for another 15 minutes and then rinsed off. Last but not least is to spray the protective hair X-Tenso Hair Serum to help to prevent dryness and damage, not forgetting to blow dry my hair and I am ready to go. Immediately after the Steambond X-Tenso by L’Oreal Professionnel I feel that my hair is smooth, straight and shiny. Wow! I feel super awesome and as if my head is lighter. After a month plus the straightening and sinning effect is still there. Now there is no unruly and frizzy hair, it is easier to manage my hair. Before this I use to have curly and colored hair; well this year I opt for straight black hair. I think it is easier to manage at the same time it does make me look younger and enhance my face features. My theme is back to basics. Overall, I am very satisfied and happy with my current hair style. 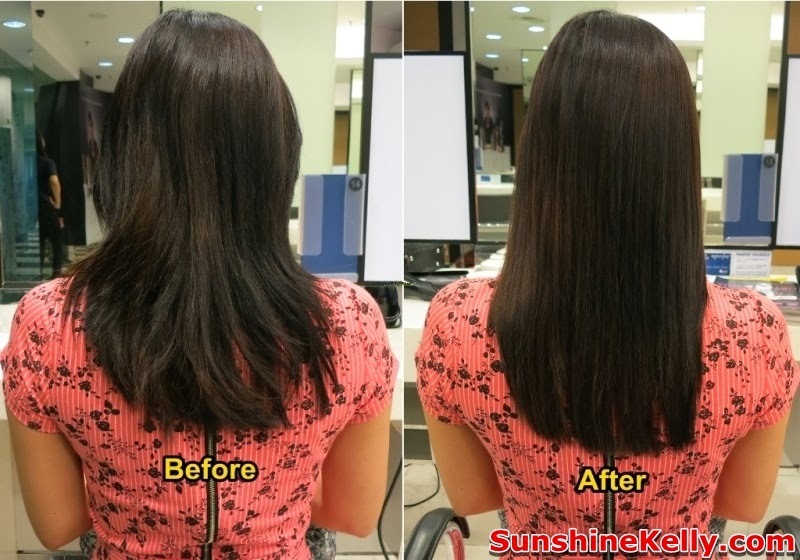 I am glad that I did the Keratin Steambond X-Tenso Hair Treatment. As you can see I look lovelier than before right? My hair now looks healthier, silky and straight. 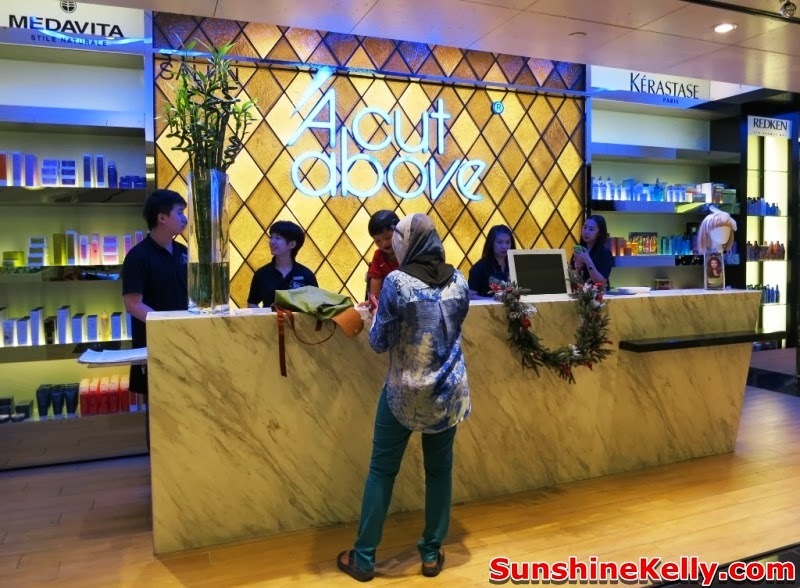 Plus thumbs up to the friendly and attentive services by Sam Chan, AC and KC from A Cut Above Salon, Bangsar Shopping Center. Hello ^^ I'm thinking of doing Steam Bond too - would like to know how long do the results last? THanks!